Official RAD Pink Skirt with Royal Academy of Dance LOGO Wrap-over tulip style skirt with stretch waistband- no more velcro or buttons to fasten before class! 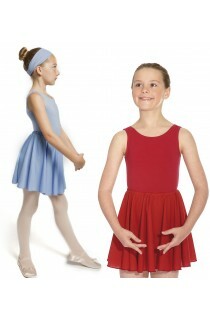 Childrens Sleeveless leotard with skirt attached Made from stretch shiny lycra this sleeveless skirted leotard has a gathered bustline and flared skirt A great alternative to separate leotard and skirt- and works out cheaper! Colours: Raspberry Pink, Rose Pink, Lilac, Red, Purple, Pale Pink, Kingfisher (Turquoise) Raspberry, Rose Pink and Pale Pink are normally held in stock. Other colours normally take 2 working days until despatch.